Refrigerator is a basic necessity for every home. Deciding on a refrigerator brand, capacity and model type depends on various factors like number of people in your house, food habits, how often you shop to stock your fridge and so on. With the introduction of new technologies, healthcare benefits and energy efficiency consumers have become more aware of their necessities and, have a variety of brands and product offerings to choose from. Buying a new fridge is not only an investment for your household but also for your future, so picking the right product is crucial. It is no longer a case of simply choosing which colour or model to go for. Today’s refrigerators are the most energy efficient ever, and they’re loaded with cool technologies that can extend the shelf life of fresh foods. · Size and capacity: The size & capacity of the refrigerator should be as per the number of members in a family. Capacity is important but it is also essential to consider the space available. Measure dimensions of the area where you plan to keep the fridge and then make sure the fridge is couple of inches less in size, so that it fits in properly. · Patterns & Designs: Refrigerators have become a part of our living area these days. Consumers today need products that fit perfectly with the new age, urban interiors of their homes. Products with good, eye-catching patterns especially in colours with matt finish and flowery designs fit perfectly with modern kitchen and high class interiors. · Cooling/Airflow: To maintain an even temperature throughout the refrigerator, especially after you open the door, it is important to know the airflow technology used in the refrigerator. The cooling of every section of every compartment at the same time is important as it helps your food to stay fresh for longer time. · Hygiene Features: You can reduce food wastage and keep your fridge fresh for a longer time with some of the new hygiene and vitamin-optimising features available in the market today. Some of the latest models have special anti-bacterial coatings on the doors and walls to prevent unhealthy bacteria formation inside your fridge, while vitamin-enhancing features keep your fruits and vegetables at their peak for a longer time to save you money at the supermarket. · Vegetable Storage: With a really fast paced lifestyle today people hardly find time to go and buy vegetables on a regular basis. These days almost all fridges offer a dedicated space for storing vegetables. It is advisable to go for the biggest capacity veggie box if one plans to stock vegetables on a weekly basis. 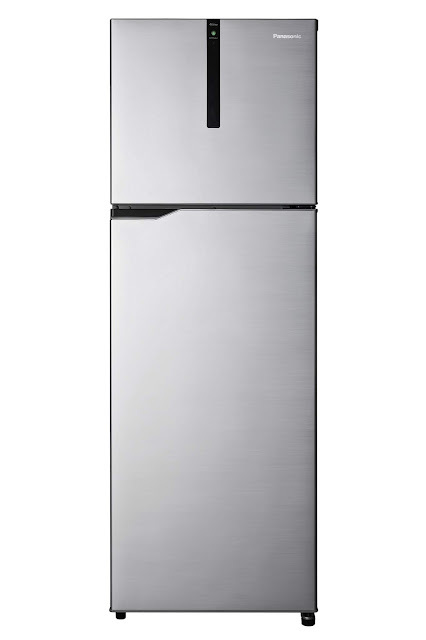 · Energy Efficiency: Today's energy efficient refrigerators use significantly less power than they did a decade ago. An energy-efficient model may cost a bit extra upfront, but you’ll save cash in the long run with lower utility bills. Some of the latest large capacity fridges are more energy efficient and come with power-saving features such as ECONAVI in Panasonic refrigerators. · Temperature control: Another friendly feature to look for is intelligent temperature control, which automatically adjusts the temperature of your fridge and freezer so that it remains constant irrespective of the conditions. It is good to opt for fridges with electronic temperature control panels as they allow you to set different temperatures for the separate areas of your fridge, as well as ‘quick cooling’ and ‘quick freeze’ options. · Technology and Price: While refrigerators are packed with features, one should still choose a refrigerator which is equipped with technology catering to one’s needs. It’s important to stick to a well-established brand providing all essential features at a reasonable price. · Warranty: Warranty is a vital aspect that you should keep in mind while making a purchase. When you're buying a new unit, check the manufacturer's website for information and ask the retailer about the warranty for that model and brand. Panasonic provides 2 years comprehensive warranty along with 12 years warranty on the compressor.